April Letter from Bishop Andrew Bellisario, C.M. At the end of the Chrism Mass on Holy Thursday morning in Rome’s St. Peter’s Square, Pope Francis handed each priest a collection of his homilies of Holy Thursday Chrism Masses as Pope, including this year’s. On the morning of Holy Thursday, during the Chrism Mass in St Peter’s Basilica, Pope Francis reflected on “three graces that characterize the relationship between Jesus and the people”. The South Sudan Council of Churches (SSCC) has said that the people of South Sudan have grievously suffered the force of the crucifixion through a war that has devastated the country from 2013. “This, rather, is the fasting that I wish:releasing those bound unjustly, untying the thongs of the yoke; setting free the oppressed, breaking every yoke; sharing your bread with the hungry, sheltering the oppressed and the homeless; clothing the naked when you see them, and not turning your back on your own flesh. This year the Fourth Sunday of Lent is the Sunday of the Man Born Blind. It is a type and the symbol of our own spiritual blindness that the Lord in his mercy desires to heal. It is a symbol of the spiritual blindness of the world, which closes its eyes and hearts to the ‘throwaway people’ our Holy Fathers advocates for with such passion and eloquence. What Pope Francis denounces as the ‘globalization of indifference’ prevents us not only from seeing those who are suffering and are in such desperate need, but prevents us from seeing Jesus himself, who identifies himself with the hungry, the thirsty, the naked and humiliated, those who are strangers and not welcome, those who are forgotten, alone and despised. 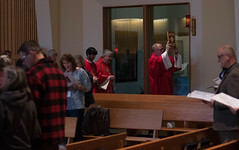 The Lenten practices of prayer, fasting and almsgiving are the traditional spiritual tools that the Lord uses to heal our spiritual vision, which has been darkened, distorted and warped by sin, so we can clearly see how to please God by living with kindness, compassion and charity; to feed the hungry, clothe the naked, welcome the stranger, shelter the oppressed and the homeless and not turn our back on our own flesh and blood, which for us as Christians includes everyone. On Ash Wednesday, when we began the Great Fast, Jesus in the gospel instructed us to give alms, to pray and to fast but to do so in a way that does not draw attention to ourselves as we perform these pious acts. He used the language of reward: warning us that when we give alms, pray and fast that if we do so only to be seen and admired by others we will receive an immediate reward, from our friends and admirers, but it is a reward which is worthless because it is transitory and an illusion and not from God. However, Jesus assures us that when we give alms, pray and fast in secret in the expectation of being inwardly changed and healed, we will receive an eternal, imperishable reward from God, who sees not only our secret actions, but our inner motivations. What is the reward we receive from God? It is the healing of our vision, darkened by sin, and blurred and confused by the lies and false promises of the Prince of this world. The reward we hope for is the capacity to see our neighbor, not as a threat or a competitor or as an abstraction or category but as a beloved brother and a sister, even, or especially in his or her most abject and profound distress. If we can see our neighbors this way, we can do what is right and pleasing to God, ‘removing from our midst oppression, false accusation and malicious speech’. Almsgiving, prayer and fasting are our traditional spiritual practices during the season of Lent. If we are faithful to these practices we can be confident that God will heal our vision and enable us to see with clarity and truth. How is this so? Let us consider for a moment the opposites of almsgiving, prayer and fasting. When we give alms, we give sacrificially to the poor without expecting anything back in return. The world teaches us to do just the opposite, to acquire instead of giving and if we do give to others to always expect something back of equal or greater value. We give alms during Lent to learn not only to be generous towards others but to recognize our inner, spiritual poverty and littleness, so as to become grateful for everything that God freely gives to us. Through the practice of almsgiving, God heals the blindness of acquisitiveness, so we can see with eyes of thanksgiving. Prayer is time given over to God. But the world tells us that time, like everything else in our lives, belongs to us, is our exclusive possession. My time, my money, my ideas, my life. On reflection, we know that this can’t be true, that time, and everything else that we possess, is a gift, given to us by God. The time we spend in prayer is an acknowledgement on our part that we belong to God. Prayer is an act of renunciation, of letting go, even if for a few minutes, of the ownership that we think we have over our time and everything that we are convinced is ours. Through the practice of prayer, God heals the blindness of possession, so we can see with the eyes of surrender and be grateful for the generosity of God, who is so lavish in His generosity to us. Fasting is a continuous confrontation with the hold that our appetites have over us – our appetite for food and drink, our appetite for entertainment, our appetite for pleasure, our appetite for amusement, even our appetite for love, companionship and intimacy. The world tells us that satisfying our appetites is the goal and the purpose of our lives: our entire economy is based on wanting more and more of everything we might possibly desire. The world tells us the more we have, the happier we will be. When we fast, we struggle to restrain our appetites. Why? So that we can be freed from the hold that our appetites have over us. Only then can God reveal to us our deepest hunger, our deepest desire which only He can satisfy. So that we can learn that nothing other than God and doing God’s will, will ever bring us the true happiness we long for. Through the practice of fasting, God heals the blindness of insatiable appetite, so that we can see with eyes of inner freedom. During this Lent, our Lord promises to heal the eyes of our hearts, so that we are able to recognize His real presence in those, who in the words of Mother Teresa, ‘are Jesus in his most distressing disguise.’ During these forty days, let us receive with gratitude from Christ, the Physician of our souls and bodies, the medicine of almsgiving, prayer and fasting, so that as His disciples we may become again the free, grateful, and surrendered men and women he made us to be. 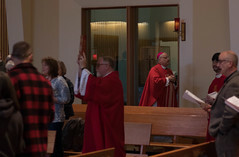 The Inside Passage is the official newspaper for the Diocese of Juneau.